I felt like I was one lucky Canadian when I was chosen to review these [re]fresh skin therapy products FOR FREE! - in exchange for my honest review, of course! I've been on the hunt for that perfect moisturizing cream for my dreadful dry skin, and when I saw this promotion pop up, I knew I had to apply for it. 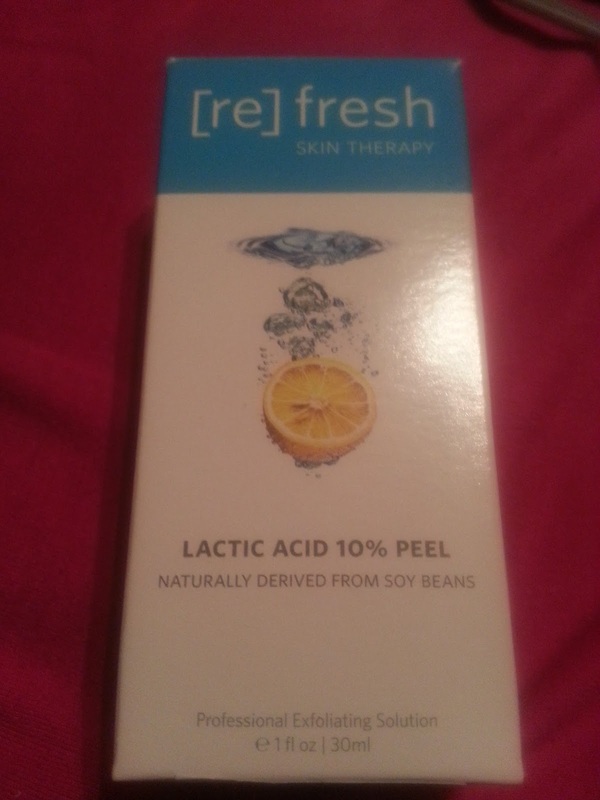 Included in my review is [re]fresh skin therapy Lactic Acid 10% Gel Peel, and [re]fresh skin therapy Hyaluronic Moisturizing Cream. These were to be used together. 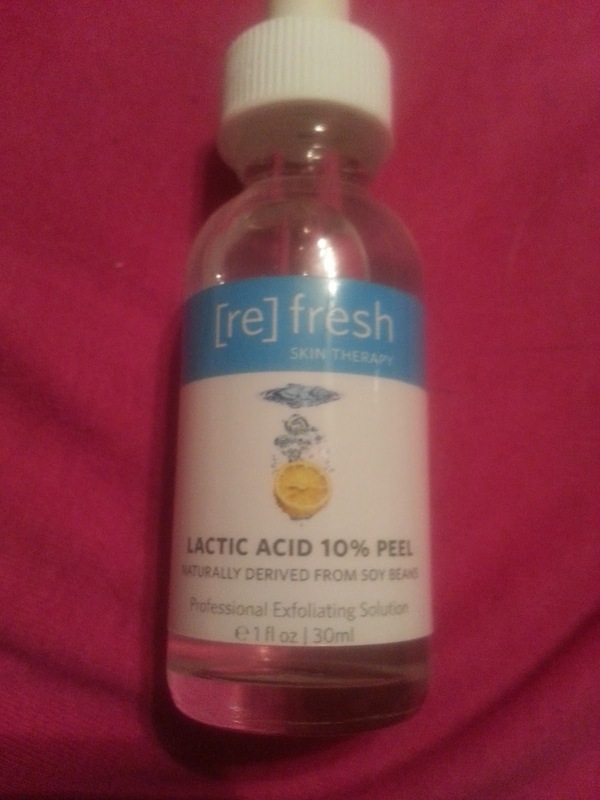 We had the choice between Fruit Acid 15% Gel Peel, or Lactic Acid 10% Gel Peel. I chose the Lactic Acid because it states that it is for people with sensitive skin. I would say that I have somewhat sensitive skin, and seeing how this is the first time using a chemical peel, I wanted to play it safe. The instructions on the peel say to dispense a little bit of product on your fingertips, and then smooth over entire face and neck. Leave on for 1 to 2 minutes, depending on tolerance. Rinse with cool water to neutralize the solution. Use in the evening after cleansing, as often as tolerated. I washed my face like normal, then applied this. I left it on for about 2 minutes because it was starting to sting a little. I know it's not good to have discomfort while using a product, so I removed it as soon as I felt it stinging. Once I rinsed my face with cool water, I then moved onto the next product I was sent. The directions on this cream are simple. Use morning and evening. Apply a thin layer to skin and allow to dry. Will moisturize and protect. The cream looks thick in the jar, but once you apply it, it thins out very easily. My skin absorbed it pretty quickly and it didn't leave a sticky or tacky residue either. 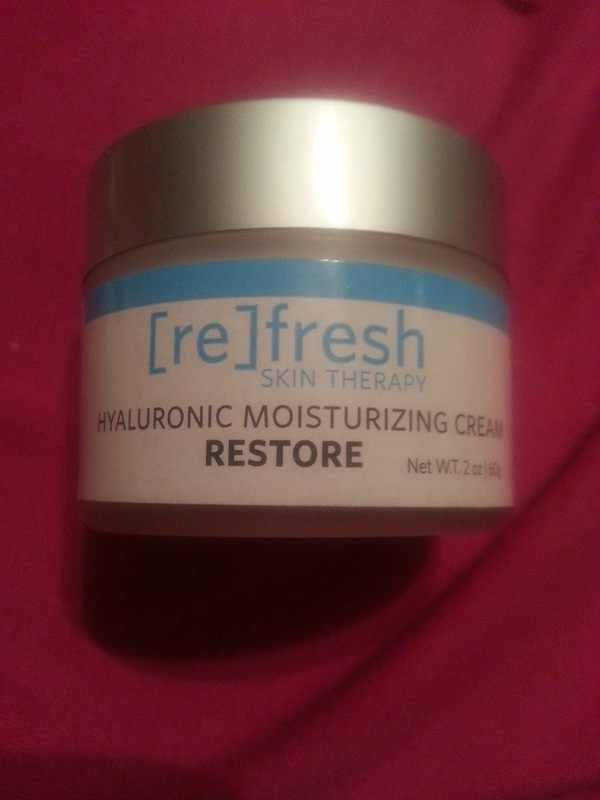 I will be honest and say that my skin felt severely dry after doing the peel and using the moisturizer alone. The cream didn't seem to be rich enough, but I find that with pretty much every cream on its own, so that being said, that doesn't mean this isn't a good product. I have been layering it with some other products and my skin looks smooth and plump. I really love hyaluronic acid, and I love that more and more companies are adding it to their products. As a whole, I would say that these products do work. My skin looks very smooth after using the gel peel, and the moisturizing cream. I would definitely recommend them to someone who is interested in performing their own peels at home. It takes less than 3 minutes, and is not messy at all. I wouldn't recommending using the gel peel more than once a week, because you don't want to over exfoliate your face, ESPECIALLY if you have dry skin like me! You will strip all the natural oils off of your face!